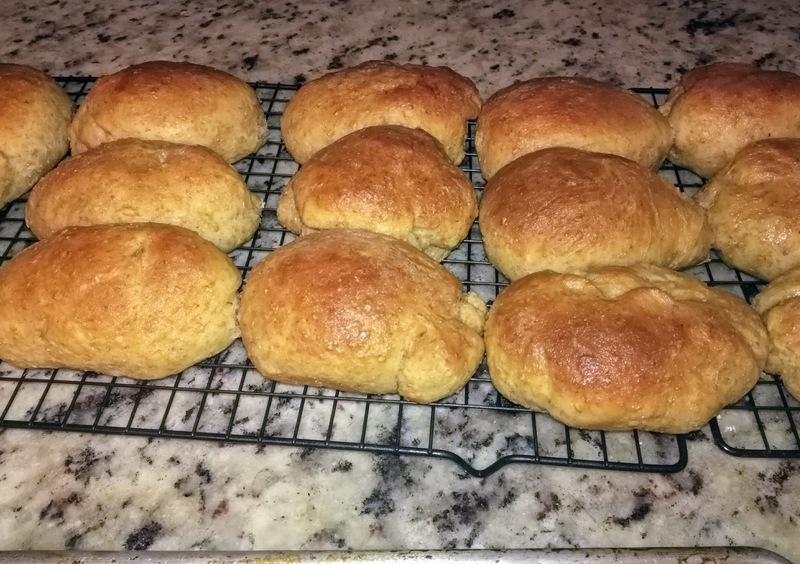 These are simple rolls to make. The rolls are soft and tender making them the perfect complement to any meal. Mix the dry ingredients (flours and salt) in a large mixing bowl and set aside. Gradually add the liquid ingredients to the bowl of flours and stir until and dough starts for form and come together. If the dough is too sticky, let it rest about 10 minutes in a covered bowl. Knead for 10-15 minutes. If necessary, add additional bread flour, a ¼ cup at a time, until you have a cohesive dough that doesn’t stick to your hands. Lightly grease the proofing bowl, add the dough and turn it so that it is coated with oil. Cover the bowl with plastic wrap or and towel and let it rise for several hours. I find about 9-10 hours is just perfect to get a perfect rise. Your sourdough starter, climate and temperature will impact the amount of time you need for the first rise. When the dough has doubled in size, it’s ready. Butter two 9x13 pans. Divide dough into two equal pieces, and divide each of those into 8 equal pieces. If you have a kitchen scale, you can weigh the dough and divide. For me, each roll usually ends up being between 95-100 grams (3.35-3.5 oz). Cover the half of dough you're not working with plastic wrap to prevent it from drying out. Once you've divided the dough into 16 pieces, shape each one by pressing it onto a clean surface to form a small oval disk. Then, gather the edges together to form an oblong ball and pinch them together to seal it. Place each roll, pinched-edge down, into the prepared pans with about ½" between them. Cover the pans and let the dough rise for another 2½-3 hours. They will double in size when fully risen. Preheat the oven to 375°F. Just before baking, beat the last egg slightly and use it to brush the tops of the rolls. Bake for 20 min, or until the tops are golden brown and the interior temperature is between 190-200F. Let cool on wire racks for 5-10 minutes. Then, turn the rolls out of pans gently. Serve warm or let cool completely on wire racks and store them in an airtight container or zip lock plastic bags.